Happy February dear readers, I am glad that January is over! It will never be my favorite month, but this year’s January was particularly dreary and sad, as was the beginning of February. The rest of this month should be better, if everything goes according to plan. My daughter’s birthday is coming up, my boyfriend will be starting a new job closer to home and before that we will be taking a trip to Spain for some much-needed vitamin D.
Actually, after a very cloudy, grey and ridiculously mild January, we are now having some nice crisp winter days with temperatures below zero and lots of sun. Perfect weather for this skirt that I made a couple of months ago! 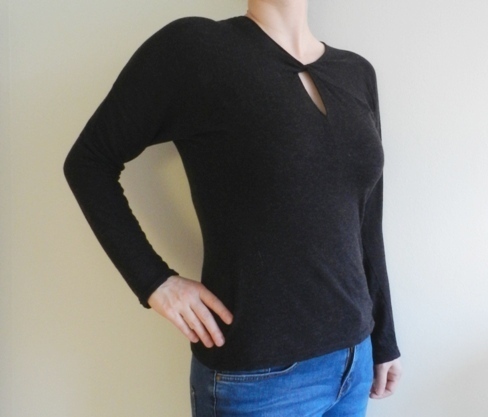 By the way, this post contains a bonus garment; the charcoal sweater with cowl is one of 2016’s unblogged projects. The pattern is the Side Gather Top (minus the side gathers) or Burdastyle 09/2012 #130, in the same fabric as used for the twist top I made two years ago. Not much to say about this top, except that it was very easy to construct and has already been worn a lot. Highly recommend! Looking at the pictures, I see that I could have done a better job pressing the pleats, but I was a bit in a rush, trying to catch the scarce daylight. 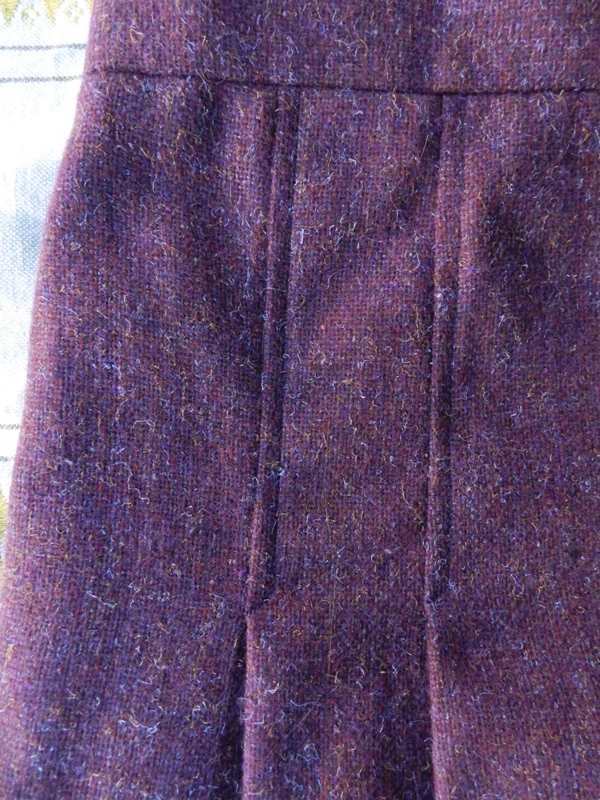 Back to the skirt: I do not recall exactly for how long I have had this lovely woven wool – anything between 5 and 8 years seems possible – but I do know that I found it at a thrift store here in Malmö. One of my 2017 sewing resolutions was to focus on warmer clothes, which moved this fabric to the top of my list. As it is somewhat scratchy with a rugged structure, I did not want it directly on my skin, so a lined skirt seemed to be the best option. My pattern of choice was Simplicity 2435 from 1978, another thrift store find. To be honest, I mainly chose this pattern out of convenience. It had already been cut and it was more or less in my size, so I could get started right away. This pattern comes in three variations. I made view 1 which has four pleats in the front and the back. View 2 has two pleats on each side and view 3 has no pleats, but consists of three panels in the front and the back. My piece of fabric was only 1.5m long, so I shortened the skirt with c. 7cm. 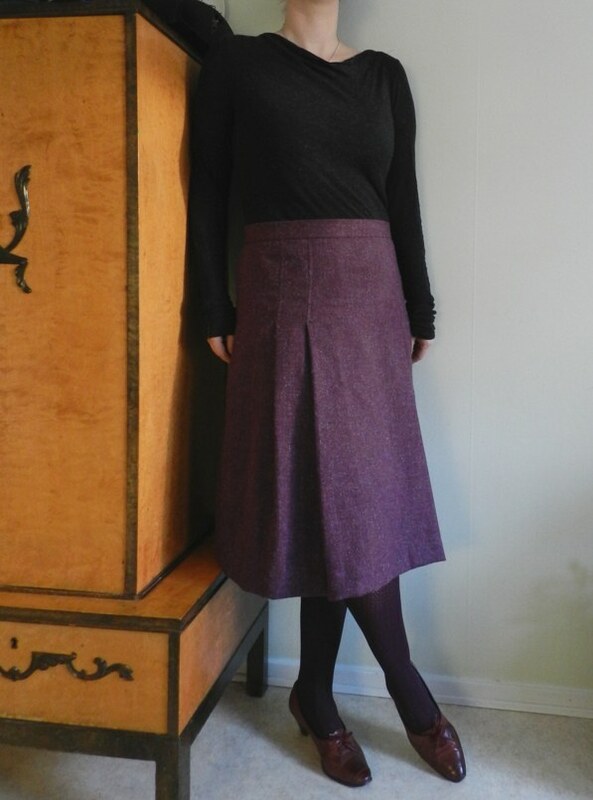 It is still a bit longer than what I usually go for in a winter skirt and I was afraid that the result would look dowdy in this somewhat old-fashioned fabric. Fortunately, the fabric is drapey and as the skirt’s hemline is quite wide, so the overall impression is not too heavy and stiff, I think. This was an uncomplicated, relaxing project to work on. My biggest problem was that all the markings I made on the fabric disappeared quickly. In hindsight this would have been a good project to try out tailor tacks. I decided to use extra wide seam allowances, as I learnt from a mishap with another skirt last year. After attaching the lining and waistband, it became much too tight. 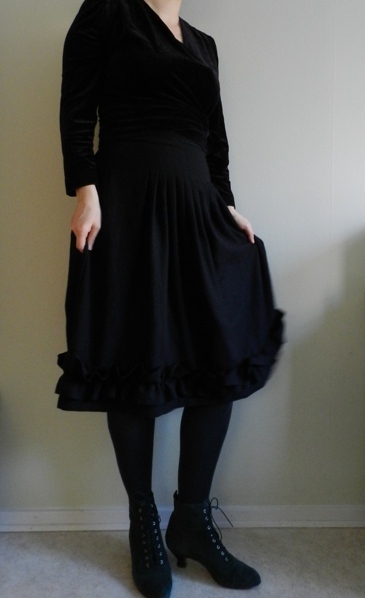 In this case, I erred on the side of caution, resulting in a skirt that is a smidge too wide. Still, much better than not being able to breath and eat! For the first time, I top stitched using two strands of ordinary thread. Worked like a charm, although I see now that the stitching is a bit uneven. Again, I blame the lighting! Per the pattern instructions, I inserted the zipper in the side seam. I changed it into a lapped zipper when I discovered that I had to take in the side seams. This way, I only had to unpick one side of the zipper and I quite like the look of a lapped zip. 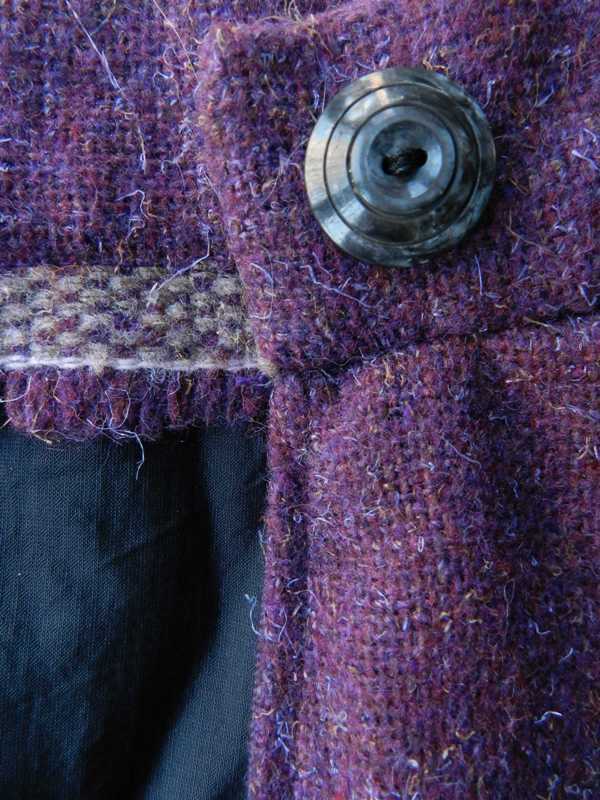 The fabric had this beautiful woven selvedge, which I wanted to preserve one way or another. 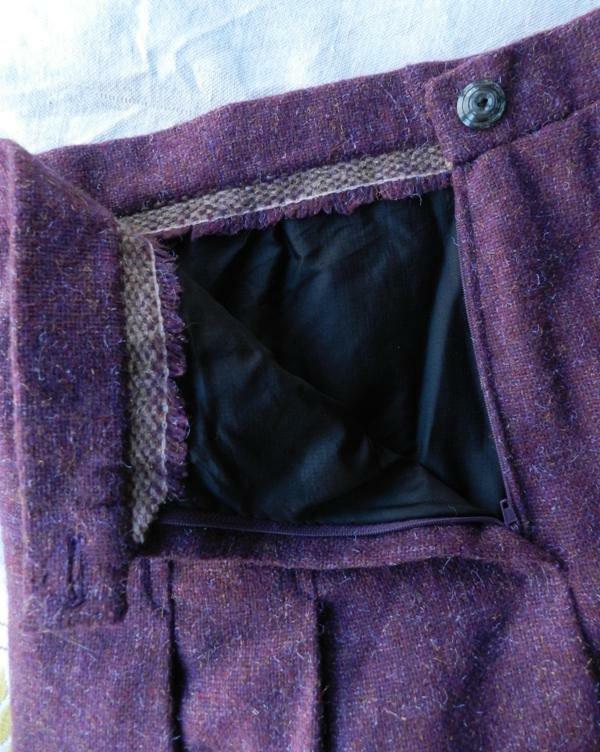 The waistband is rectangular, so I cut it along the selvedge and instead of folding it to the inside, I left it exposed, simultaneously reducing bulk. The lining was the first thing in the right colour and lenght that I managed to locate in my stash. It appears to be some kind of nylon that is somewhat water resistant and windproof. Over a decade ago, I bought many metres of this stuff when a local fabric shop closed down and this was the last of it. 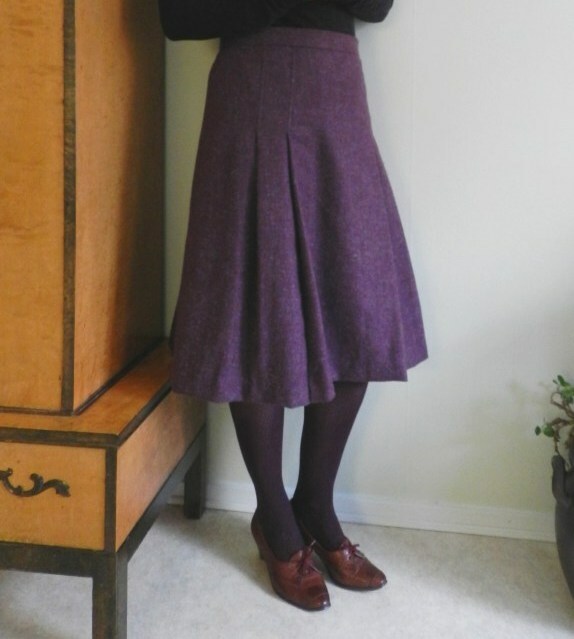 Perhaps this lining is more suitable for outerwear, but it does make this skirt extra toasty warm and easy to pair with a shorter winter jacket. 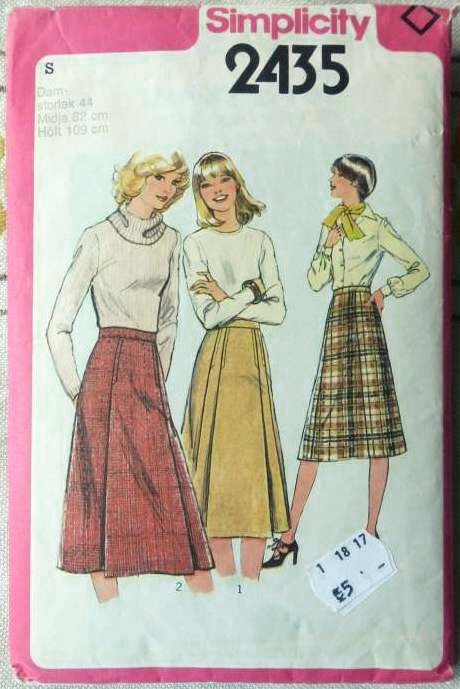 Hurrah for windproof skirts! Just showing off that beautiful fabric containing specks of many different colours. 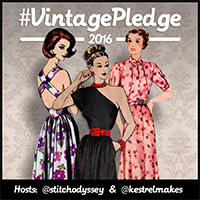 And let’s not overlook that pretty vintage button reflecting my kitchen windows and the building across the street. 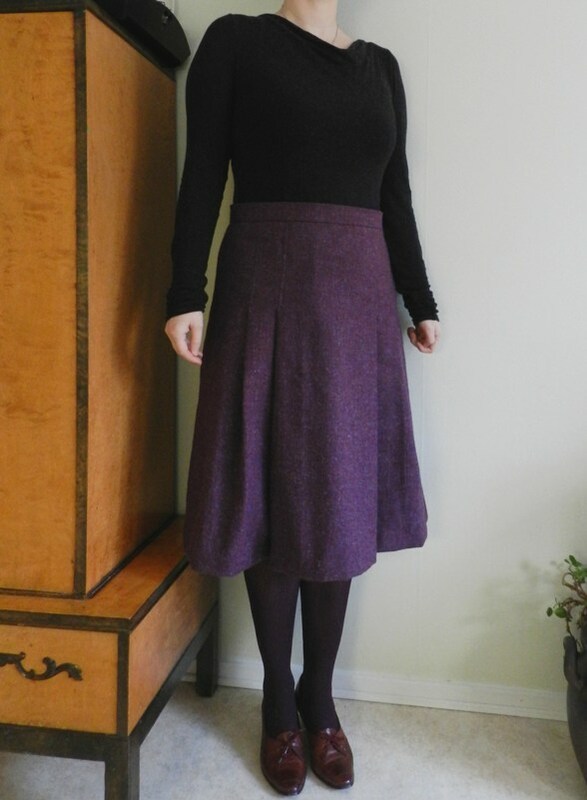 The skirt has been in regular rotation since last week and I expect to get more wear out of it in the next couple of months, especially now that I found a moss green cardigan with purple details in the thrift store that I think will go perfectly with the skirt. I do like the cowl sweater, but it is not in the same league as the skirt when it comes to keeping me warm. I wore the latter on my flight home last Sunday and it felt like my legs were covered with a blanket! 1.5m woven wool, not sure where I bought it and how much I paid for it, but it was not super cheap if I remember correctly. 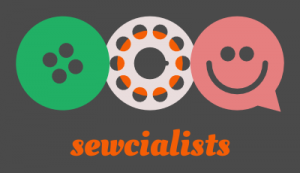 Maybe SEK 50? Lining, zipper and waistband interfacing all came from the deep stash, so I have no idea what they cost. The lonely button came from a bag of old buttons that my boyfriend’s grandmother gave me, so that one was free. Lovely skirt and great silhouette! It is always surprising how an unprepossessing pattern can turn out such a nice garment with the right fabric and a good fit. Well done! Thank you! Even though it is somewhat boring, I think that this pattern was the right choice. The fabric would probably not have worked as well with a more elaborate design. The skirt also turned out more flared than I expected based on the pattern art.